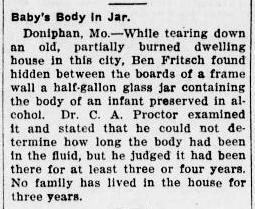 Among the more morbid topics that I’ve “collected” from historical newspapers is that of “preserved infants in jars.” After stumbling upon one article about the unexpected discovery of a human in such a state, I began to search for similar stories and found a few more. You have to wonder if the preserved remains of these babies were lost from a museum or medical college during transportation or after theft or if they were the grim souvenirs of infanticide. Another possible scenario is one where someone attempted to cover up the birth and/or death of a stillborn. 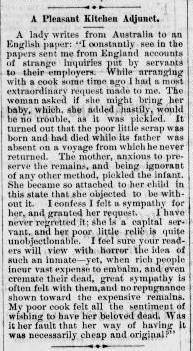 Or were these pickled infants the products of grief-stricken parents who were unable to lower them into the grave? The background stories of some of these unfortunate souls we may never know. Ahhh, history. In 1885, a NJ fisherman found a box stuck in a muddy embankment along a creek. Inside were four glass jars, three of which contained the remains of infants in various stages of development and decomposition. In one jar were two male infants that didn’t appear to be fully formed. The other two bodies had been live births. One male was thought to be the victim of a murder because of a stab wound on his neck. The final male in the third jar’s cause of death couldn’t be determined because the glass had broken and water had seeped inside, disrupting his preservation. There were no remains in the last jar; only sponges. 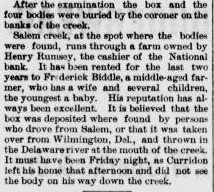 After the examination, the coroner had the box and the remains buried on the banks of Salem’s Creek, near the site of the initial discovery. A stillborn boy was found in an alcohol-filled fruit jar above an aqueduct by a janitor in 1885. Another alcohol-preserved infant was found tucked away behind the wall of a vacant residence that had been damaged by a fire in 1920. A doctor estimated that it had been in the glass tomb for three or four years. 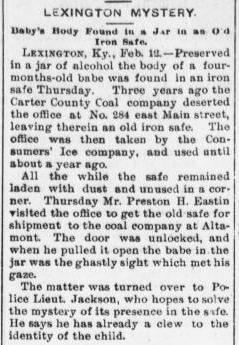 When Carter County Coal vacated its office around 1894, they left behind an iron safe which remained in the office throughout the use of the premises by an ice company. In 1897 Preston Eastin prepared to ship the dusty safe to the coal company, first opening it to inspect its contents. He wasn’t prepared for the grisly discovery of a four-month-old infant floating in a glass jar of alcohol. Eastin reported the matter to the police. As of yet I have been unable to find out additional information as to the outcome of the inquest. 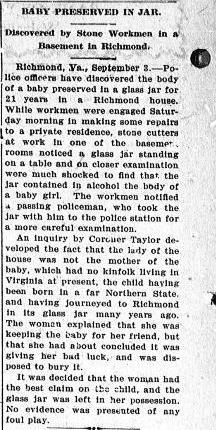 In Richmond, Virginia, men working in a basement noticed an infant female suspended inside a-you guessed it-glass container of alcohol. The resident claimed that the infant was born in the North to one of her friends at least 21 years prior and she was holding onto it for reasons not listed in the newspaper. The keeper of the jar intended to bury it because she felt that its presence was bringing her bad luck. A coroner believed that story, decided that no crime had been committed, and allowed the homeowner to do with the pickled infant as she wished.